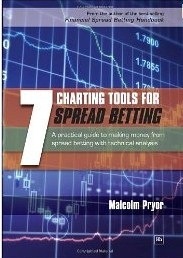 In 7 Charting Tools for Spread Betting Malcolm Pryor identifies 7 technical analysis tools of particular interest for spread bettors. The focus is on practical use of the tools rather than academic theory. There is a chapter on each tool, but the tools start to get used in combination, and the final chapter contains a detailed case study in which all the tools get to play a role. The 7 tools are: average true range, directional movement, moving averages, support and resistance, oscillators, relative strength, and momentum.